Growing up in a big family of six, I was blessed with all the love and affection that such a household generally had for its kids. My formative years had a significant impact on my decision to become an interior designer. It let me harmonize objects with emotions within a living space to create a loving atmosphere, making homes out of houses. But something that really stayed with me was my mum’s brilliant culinary skills. And when this developed into a great passion for cooking, I decided to improve on what I believed to be an immensely productive prowess. Needless to say, I went on to make sure I had the best tools and appliances in my perfect little kitchen. This really taught me a thing or two about the culinary world and one of them that I really got hooked on was cooking knives. I have a real fascination for these wonder-tools without which you cannot possibly get to cook anything at all! So to know more about hot knives cutting through butter, stay put and read along! Why is it a popular brand? Cutco was established in 1949 and has gone on to become one of the largest manufacturers of cutlery items, utensils, flatware and cookware in the United States and Canada. It has stayed long enough to be a brand to reckon with and consists of more than 600 employees who work together to ensure only the finest quality for an excellent dining experience. Cutco also manufactures other gears like sporting knives and shears. All of its products are sold through in-home sales demonstrations online, local events, or at Cutco retail locations. The name Cutco had been inspired from the name of another company that it was formerly a part of: ALCOA, Cooking UTensil COmpany. Thereafter, Cutco evolved when it brought in the innovative features of the “wedge-lock” handle and “double-D” recessed edge that was used on some of its knives. In 1982, a management buyout took Cutco as a private company. And although it was a massive leap of faith for the management team, it sealed the reputation of Cutco and gave it the identity that we know it by today. The ergonomically designed wedge-lock handle on the Cutco knives ensures a “hand-perfect” comfortable grip for the user. It prevents any risk of accident and enables swift cutting action. It is made using highly-engineered thermo-resin, which makes it exceptionally durable and resistant against regular wear and tear. Cutco equips many of its knives with its patented Double-D recessed edge design that ensures a smooth and clean cut for chopping or dicing rough and coarse meat. It uses a sort of cleaving action that ensures a neatly cut finish. All of Cutco’s products carry the brand’s “Forever Guarantee”. This is a lifetime warranty from the brand that offers you free sharpening, honing, buffing or even replacing your knives or accessories from the brand, if necessary, for free. No receipts will be required for this service. All of Cutco’s knives are manufactured using 440A high-carbon stainless steel that provides an immensely sharp and smooth cut with high precision. This is one knife that you cannot possibly go wrong with. It is one of the best ones from the brand that provides precision cutting and assists in bringing depth and detail to whatever it is being used on. The 1728 7-⅝” Petite Chef by Cutco is made of high grade 440 high carbon stainless steel with the brand’s patented razor-sharp blade finish. As I’ve already mentioned before, performance-wise this knife hardly leaves room for any mistake at all. Therefore, for someone who’s not a pro like me, this knife achieves stunning results, requiring only a fraction of effort or knowledge in this department. To make things easier, the ergonomic handle design provides a resting and gripping spot for the thumb and forefinger. This ensures total control over the cutting action and rules out any potential risk of an accident. It is great for every kind of cutting, chopping, dicing, slicing or even julienning. Feel free to prepare perfect steaks and vegetables or even your favorite seafood dish using its precise angling. What’s more? It’s even apt for creating those subtle, innovative details for the artists at heart! The 7” Santoku Knife from Cutco is one tool that every kitchen should have, and every cook should be a proud owner of it. Formed in a “triple rivet construction” using superior-quality silver-alloy rivets, this knife offers an unfaltering precision and sharpness that doesn’t leave a single mark behind. The Cutco Santoku Knife is the ideal device for slicing, chopping or dicing vegetables, meat and fish. It can even be used for preparing intricate dishes like sushi or filleting and butterflying chicken breasts or fish. The low sharp tip of the knife enables you to make critical and delicate cuts or debone fish, bird or other kinds of meat. Another aspect that I really liked about this particular knife is that the straight-edge blades offer the kind of quality that is strong, yet considerably lower maintenance than most others in the market. It can also be safely sharpened in your house yourself. The versatility and ease of usability of this product are truly admirable as is the design that ensures absolute safety and a firm grip while achieving great cuts. 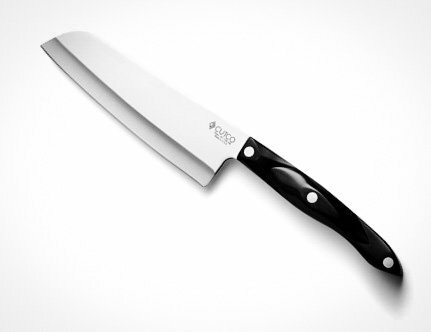 Next, we have the classic cutting French Chef Knife from the house of Cutco. 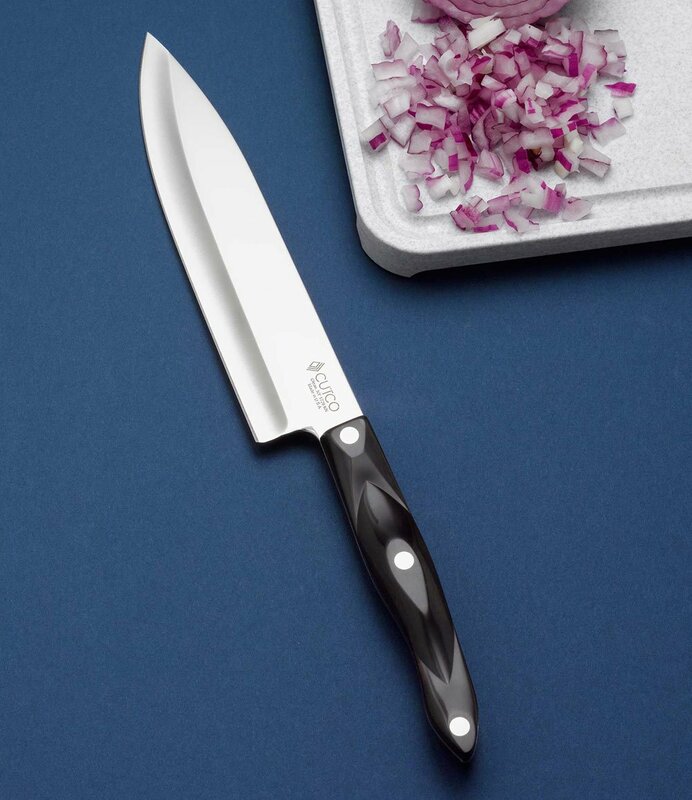 This knife is an absolute essential for every kitchen due to its sheer versatility when it comes to achieving perfection for basic cuts. As a designer, I attach high value to the purpose and contribution of basic tools and instruments that provide a foundation for any design. This is what primarily achieves a beautiful and lasting result. Quite similarly, when it comes to kitchen tools, one should always assess the potential and understand the value of a basic accessory. 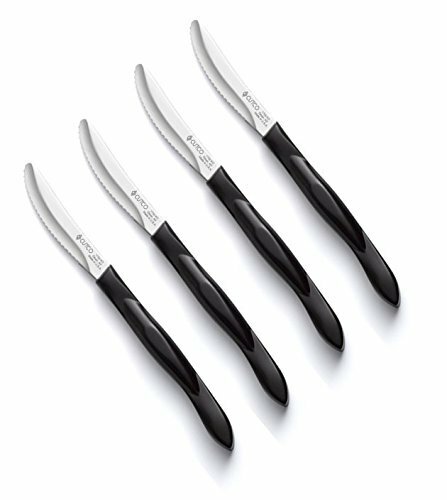 This French Knife is immensely useful in cutting, chopping, dicing, slicing and mincing vegetables and fruits. It can even be used to scale fish and dice tender meat. It gives you a wide-angled precision that chops stuff up really fast and can be efficiently used to pick and transfer ingredients from the cutting slab to the utensil. The fatigue-resistant design does not exhaust your hands and ensures that the work doesn’t get turned into a tedious chore. This classic brown model of 4 table knives in a gift box packaging from Cutco not only makes for a great cutlery addition for your refined kitchen tastes, but it also scores high as an excellent gift to anyone for their happy dining scenes. These table knives are designed to cut cleanly through any food notwithstanding even the slightest resistance of any sort when it comes to meat, fish or fibrous vegetables. 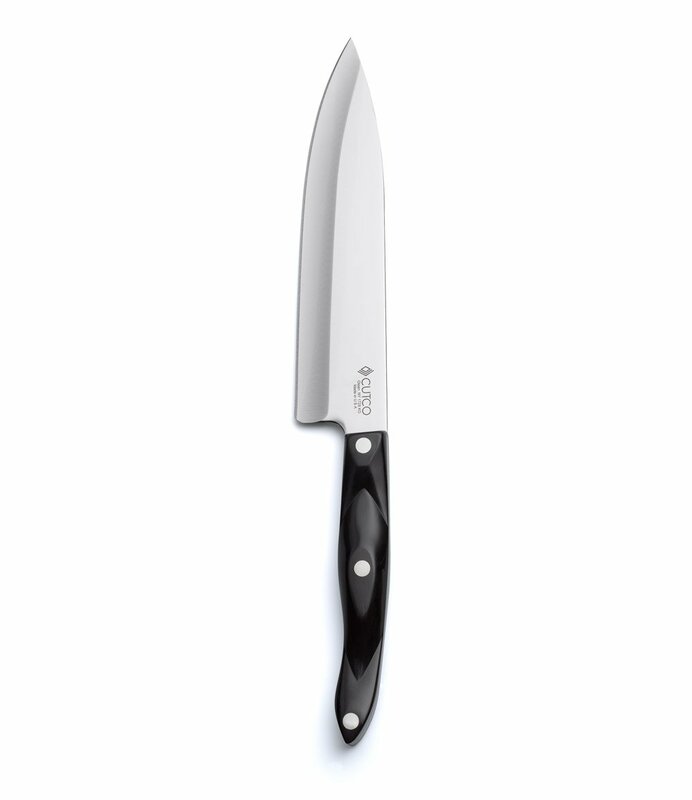 The knives feature a patented double-D cutting edge that provides a sharp and smooth cut by a kind of cleaving action. This makes it perfect for cutting steaks, ribs racks or other leathery substances. Having a great love for cooking and being a sort of “knife-enthusiast” myself, I have come across, bought and used many such table knives that initially had claimed big on performance. But unfortunately, more often than not, it so happens that table knives flake in design and quality that can make them chip or bend if used with a lot of force and pressure. The blades, too, become blunt after a point of time rendering them useless. But I noticed that the design on the Cutco table knives enables them to work with minimum pressure, and it doesn’t require you to exert a lot of force to get the job done. The quality of the product is better than most others in the market, and the handle design makes for a comfortable grip. Suitable for preparing salads or using to spread condiments. Since I harbor a great love for putting things together with care and affection in a living space, I do go to great extents for achieving the perfect harmony of finish and taste in my cooking as well. This is my way of expressing my love and care for the well-being and satisfaction of my family. And, I’m glad to say that the Cutco knives go a long way in helping me with what I value and love.